Saying "I'm sorry" is simple, but apologizing authentically and effectively is often a complicated and sometimes challenging responsibility. Whether you forget an important business meeting, accidentally hurt a friend's feelings, or simply make a mistake, there are a lot of mental blocks that can get between us and a clear, honest apology that not only moves the situation forward, but allows us to feel better along the way. 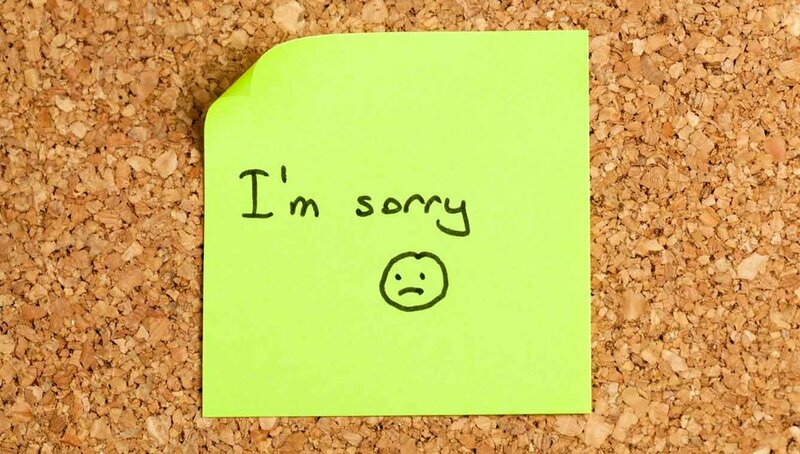 Here are 5 ways to develop and deliver an authentic apology. This is the hardest first step. When we realize that we've done something wrong, the guilt and denial often sinks in before we can fully analyze the situation. This can lead to delaying an apology, not owning up to our role in the conflict, or even sometimes lashing out at the other person(s) involved. The simplest (though arguably most challenging) first step to an authentic apology, is to consider why you want to apologize in the first place. Considering the facts only (let go of any judgement or explanations of yourself, others, or the situation) write out what you did that you feel you want to apologize for. Put yourself in the other person's shoes. I know, it sounds cliche, but putting ourselves in someone else's shoes when we're feeling guilty, judged, or even angry, can be extremely challenging. Start by considering what sentiments the other person(s) are expressing. Are they angry? Sad? Disappointed? Insulted? Consider if you can understand (not necessarily agree) where those emotions might stem from in them. If you're not sure how they're feeling about it, consider how you might feel if the situation was reversed. Not if they had done the same thing to you, but really try to consider how you would feel if you were them in this situation. Once you understand where they're coming from, even if you don't agree with it, you can start to address the apology itself. Authentic apologies come from one thing... authentically feeling sorry. If you are not feeling sorry for what you did (ie: you think it was the right decision for you, you had a reason, etc.) consider apologizing for the way you made that other person feel. You just put yourself in their shoes, so you can do your best to imagine the feelings they are having. If you can understand that the feelings they are experiencing are linked, in their mind, to your actions, you can apologize for how your actions made them feel. Find one (or a few) words that describe the feelings you are apologizing for (in whole or in part) contributing to. Examples: "Insulted" "Betrayed" "Rejected" "Teased"
And remember: make your apology complete. If there is a part of the apology you are avoiding, don't. It's not going to feel better if you don't apologize completely. This does NOT mean take blame. It means consider the situation from all sides, and be honest with yourself about what you have to apologize for. It's okay for this to be uncomfortable. Each time you do this, you'll become a stronger version of yourself. If you're stuck on the blame, consider this: What is that blame getting you? Write out who you are blaming, and what you are blaming them for. Then underneath that, write out two columns: "Benefits of Blame" and "Costs of that Blame." Consider how you can take responsibility for moving the situation in the direction you want it to go, even if that simply means letting go of blame. Blame is in the past; it can't help the present situation. Even if blame feels like it is protecting you, it is probably costing you more overall. Don't blame the other person. Don't blame yourself. Look forwards: Regardless of who is "right" or "wrong" in the situation, it is your responsibility (aka opportunity) to move the situation forward positively, no matter what. Just do it. You are apologizing to mend your relationship, you are apologizing to soothe the other person(s), but you are ultimately and most importantly apologizing to set your own mind at ease. Remember that the fear of apologizing comes from the fear that apologizing will make you feel bad/worse, but in fact, it does the opposite. When you can give an authentic, complete apology, it makes you feel amazing, and you are no longer subject to your own fears and judgements. When in doubt, I use this mantra: My value is not success, my value is courage. On the Goga is a Philadelphia, PA mobile yoga studio that brings corporate wellness, corporate mindfulness, corporate yoga, private yoga, meditation, wellness coaching, executive coaching, yoga and wellness parties to you in your space.